More and more people are feeling the pressures of life, being literally overwhelmed in today’s accelerating world of constant change. We are all being challenged with the need to relax and cultivate mental peace to counter the growing stresses within our own lives and what we see around us. How do we keep up our energy and stay mentally and physically balanced so that we can maintain our composure and prevent harm to ourselves? How can we return to a road of vibrant health, boundless energy, peace of mind and wellbeing? The answer is through meditation. The ancient practice of meditation teaches you how to calm your mind to find an internal mental peace and tranquility despite all the stresses surrounding you. The benefits of learning how to meditate include the ability to enjoy a quiet empty mind, better health, more energy, and wellbeing. There are not just physical and mental benefits to meditation but profound spiritual benefits as well, which is why meditation has become a foundational practice within many spiritual traditions. Even so, few people know how to meditate correctly to reap all its possible benefits, and even fewer understand how it helps nurture spiritual growth and spiritual strength. 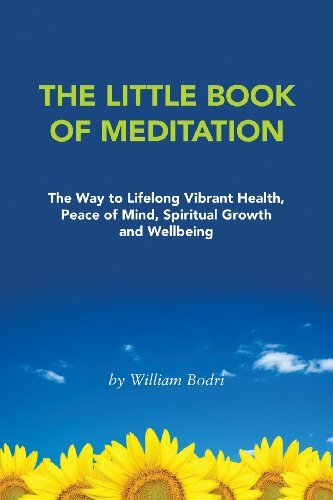 In this small book you will learn everything you need to know, including answers to the most often asked questions, to be able to master four of the most common meditation practices found across the world. You will learn how to recite mantras or prayers to quiet your mind. You will learn how to watch your thoughts and behavior with alert awareness, called vipassana mindfulness meditation practice, so that your wandering thoughts calm down. If you learn how to constantly watch your mind and your behavior with an inner mindfulness, you will be continually practicing self-improvement and purifying your consciousness. You will also learn visualization concentration practice, which has been used by many famous scientists, to cultivate the ability to hold visual images in your mind without wavering. Lastly, you will learn the methods of cultivating your breath, or respiration, through yoga pranayama practices and anapana practices that teach you to watch your breathing to calm your mind, and even attain high spiritual states called samadhi. While you will learn how to master the big four methods, other meditation techniques are also introduced that come from not one, but from a variety of spiritual traditions. These methods will not only teach you how to live better, but will also give you the tools for mastering this thing we all have called "consciousness" and learning about the true nature of your mind. The results of meditation practice not only lead to greater internal peace, but physical changes such as the rousing of internal energies that lay the foundation for higher spiritual growth and wellbeing. These physical changes include more energy, the healing of internal illnesses, muscle softening, greater flexibility and longevity. You will learn how to lay this foundation through the meditation practice of quieting the mind, how these internal energies arise and what they do, and how wisdom and merit-making can actually lead you to even higher stages of meditation progress. You’ll also find answers to the most typical questions about the diet for meditation practice, sexual discipline, and even how to detoxify the body for better health, all of which may speed your meditation progress. Most of all, you will learn how to set up a practice schedule for meditation that fits into in a busy life. In short, if you wanted just one book on how to meditate for yourself or your friends in order to teach them how to practice, this contains all you need to know.